Tours of Central Park by carriage are available from 10am to 4pm and from 6:30pm to 11pm. Horse and Carriage Rides operate all year. The evening is the best time of day. This is very beautiful during the winter but it will also be quite cold. We are comparing Central Park Horse and Carriage Ride Prices from leading ticket suppliers and Try to find you Cheap tickets prices on the market. A great opportunity to get around in the centre of New York City like a New Yorkers before motor vehicles jammed took over the city’s streets. This is a tour of one of the most famous parks in the world which passes by many tourist attractions and places of interest. Among other sites, the route covers the Bow Bridge, the Conservatory Garden, the Imagine Mosaic, the Belvedere Castle and the Central Park Carousel. Along the way you will pass many iconic locations which you may well recognise as the backdrop of some of your favourite films. This entertaining horse-drawn carriage ride is suitable for people of all ages. It is particularly worthwhile for people needing an introduction to famous Central Park and for couples looking for a romantic tour of the park. 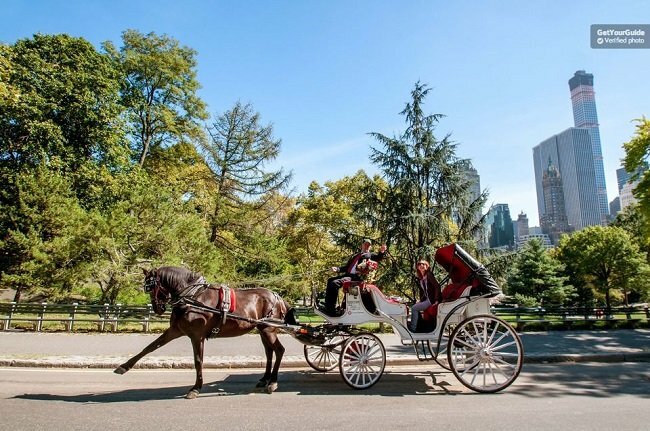 Your Experience With Central Park Horse and Carriage Ride? Set off on a romantic horse-drawn carriage ride and see many iconic places of interest and buildings around Central Park. Make friends with your friendly horse before you go. Take part in a real New Yorker experience and see the city as the Big Apple’s residents did in the times before motor vehicles. Listen to informative narrative of the carriage driver about the NYC and the places you visit on the tour. See locations of Central Park that may be familiar to you from various famous movies. What Central Park Horse and Carriage Ride Includes? 20 or 50 minute Horse and Carriage Ride (depending on the option selected). Feel free to ask carriage drivers to take a photo of you and the horse. If you take a late ride, around 9 pm for example, you can enjoy a very romantic experience. The driver will also supply you with information about the places you see during the ride. Travelers Reviews about Central Park Horse and Carriage Ride? This activity has the 4.2 rate on the Get Your Guide website (out of 5), 4.5 on Viator and 5 on TripAdvisor. People that partook the carriage ride have a high opinion about the experience for the most part. In general, their reviews imply that the driver was informative and forthcoming, willing to stop for taking photos along the route. Certain posts underline that the carriage ride of Central Park is a great introduction of the park and historic places. Some carriages can accommodate folding wheelchairs (please enquire in advance). You don't need to print the voucher, mobile versions are acceptable. For early cancellations, you can claim a full refund. The price of the ride is per carriage, not per person. The capacity of the carriage is a maximum of 4 adults. If it the tour is canceller (for example in severe weather conditions) then you may choose an alternative day or receive a full refund. Youcan find carriages available for the ride between 4pm and 6:30pm, but they are fewer at that time. Departure Point: 59th Street and 6th Avenue.